When it comes to the Italian peninsula, there had been a slew of recent archaeological excavations fueled by underground metro works, ranging from aqueducts to ‘Pompeii like scenes’. 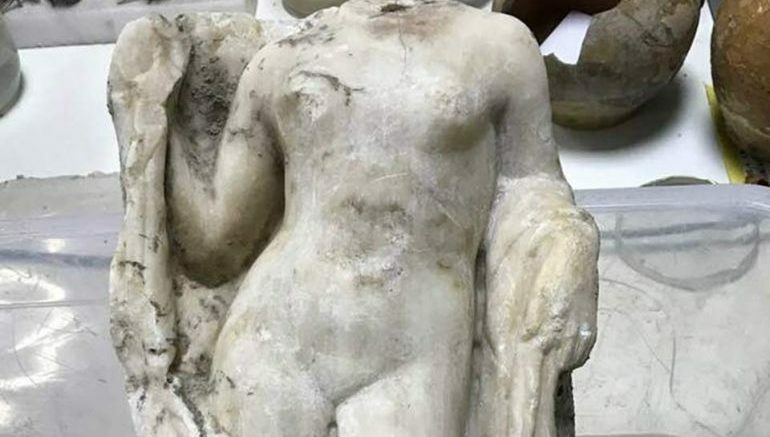 Now crossing over the Ionian Sea and moving into the Greek peninsula, a dig for the Thessaloniki Metro revealed a headless statue of Aphrodite, the Greek goddess of love and beauty. The metro works further divulged the presence of floor mosaics dating back to the 4th century AD. 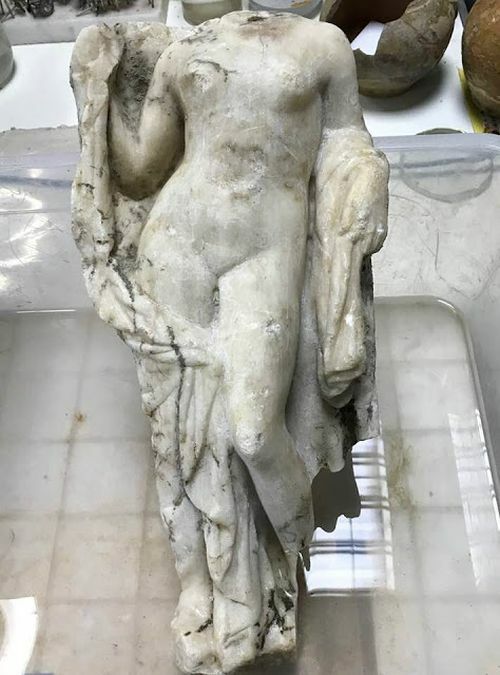 The statue of Aphrodite was discovered at the site of the Hagia Sophia station (named after the Hagia Sophia of Thessaloniki, one of the oldest churches in the city). Interestingly enough, the sculpture was identified near the very same area which revealed an entire fountain complex only a few weeks ago. And just to provide a context of the archaeological legacy of Thessaloniki, this statue is the latest find among the whopping 300,000 antiquities that were discovered during excavations in and around the Greek city. Now other than this sculpture, as we fleetingly mentioned before, the archaeologists excavating the area (near the southern entrance of the Hagia Sophia station) were pleasantly surprised by the well-preserved state of the 4th-century mosaics. 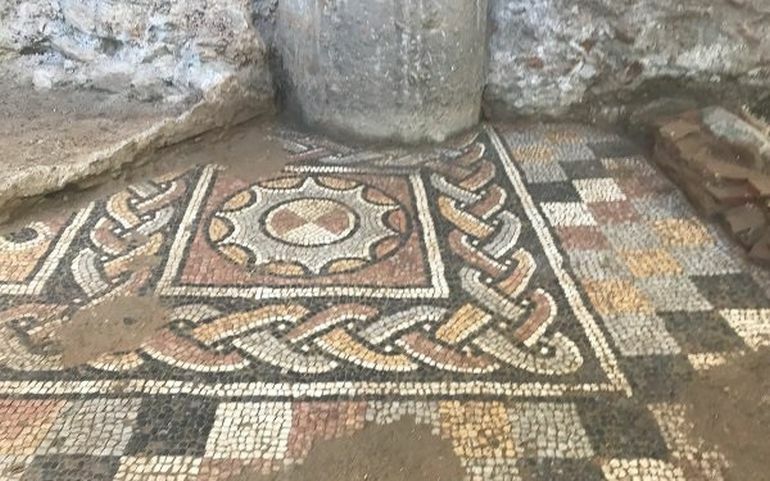 Showcasing their geometric patterns, these multicolored mosaics were possibly a part of a public building complex or at the very least bedecked the floors of an urban villa. In any case, this unidentified complex was destroyed by the 5th century and a marble-lined square was then built atop its structural remains. The archaeologists were also able to find a medal with an engraving of a woman in a seated position (with her visage being damaged) along with a child. Additionally, the researchers came across the ruins of walls, baths and possibly even a tank that used to supply water to the bathing facilities. These were complemented by the fragments of broken glass that allude to the bevy of ancient aromatic substances kept in jars that were applied by the bathers. The findings will be evaluated by a special committee of the Ministry of Culture, in which we also participate to find the best way to exhibit them.